For the downtown core (CBD), see Central Business District (Miami). Downtown Miami is an urban city center, based around the Central Business District of Miami, Florida, United States. In addition to the central business district, the area also consists of the Brickell Financial District, Historic District, Government Center, Arts & Entertainment District and Park West. The neighborhood is divided by the Miami River and is bordered by Midtown (Edgewater and Wynwood) to the north, Biscayne Bay to the east, Civic Center and Overtown to the west, and Coconut Grove to the south. As of 2009, there are approximately 71,000 year-round residents in Greater Downtown (including Downtown's Brickell, Park West, and Arts & Entertainment District neighborhoods), with close to 200,000 populating the Downtown area during the daytime, making Downtown Miami one of the most populous downtowns in the U.S. after New York City and Chicago. With recent mass construction of high-rise residential buildings and office towers, Downtown has experienced large growth, with new shops, bars, parks, and restaurants opening up, attracting many new residents. Along with Brickell, Downtown has grown from 40,000 residents in 2000, to over 70,000 in 2009, making it one of the fastest-growing areas in Florida. It was estimated in February 2010, that about 550 new residents move to the Downtown area every month. As of 2009, over 190,000 office employees work in Downtown and Brickell. Downtown is served by the Miami Metrorail at Historic Overtown/Lyric Theatre, Government Center, and Brickell stations, accessible from Broward and Palm Beach counties via Tri-Rail transfer station. The Metro connects to the Downtown Metromover, which encompasses 22 stations on the clockwise Inner (or Downtown) loop and counterclockwise Brickell and Omni branch loops. Government Center station is Downtown's main station and allows for transfers to all Metromover loops, Metrorail trains, and Metrobus lines at the Stephen P. Clark Government Center. An aerial view of Downtown, including the neighborhoods of Brickell, Park West, Arts & Entertainment District and Edgewater. 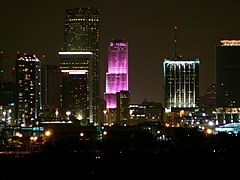 The Central business district (CBD), better known by locals as simply just "Downtown", is the historic center of Miami, and what is traditionally called "Downtown". Downtown is bound by NE 6th St to the north, Biscayne Bay to the east, the Miami River to the west and south. 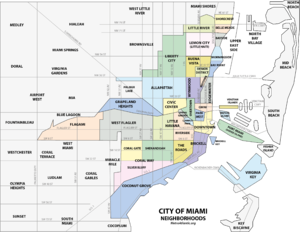 Within this area, is where the majority of Miami's historic buildings are, the main shopping street, Flagler Street, museums, libraries, offices, schools and colleges, as well as the vast majority of local, county, state and federal government offices and courthouses. Miami Historic District and Government Center are also located within the CBD. Brickell is south of the Miami River, and is a mixed upper-class residential neighborhood as well as Miami's major financial district along Brickell Avenue. The Shops at Mary Brickell Village and Simpson Park are located within Brickell. Brickell is directly served by the Miami Metrorail at: Brickell Station, and by five Metromover stations on the Brickell Loop. The Arts & Entertainment District is an urban neighborhood with numerous hotels, and high-rise residential buildings. The neighborhood's former name Omni comes from the Omni International Mall on Biscayne Boulevard. The district borders Biscayne Bay the east, NE 2nd Ave to the west, NE 21st St to the north and I-395 to the south. Pace Park, Adrienne Arsht Center for the Performing Arts, and the (former) Miami Herald headquarters are located within the district. The Arts & Entertainment District is served by the Miami Metrorail at: Government Center Station, and by two Metromover stations on the Omni Loop. Park West is the neighborhood just west of Museum Park, east of NW 1st Ave, south of I-195, and north of NE 6th St. Park West was primarily known for its nightclubs, and in recent years has been the talk of much revitalization and project proposals for the revitalization of the area. By the end of 2015 most of the nightclubs along the former club row west of the MetroMover from the Freedom Tower station to the Eleventh Street Station have been demolished to make way for planned construction of Miami World Center. Park West is directly served by the Miami Metrorail at: Historic Overtown/Lyric Theatre Station, and by three Metromover stations on the Omni Loop. The Miami Jewelry District is a sub-neighborhood of Downtown within the Central Business District historically known for its numerous jewelry stores, jewelers and gem dealers. It is where a variety of jeweled products are sold and is one of the three jewelry districts in the United States. It comprises four city blocks, bounded by North Miami Avenue, NE 2nd Avenue, East Flagler Street and NE 2nd St. Shoppers can find designer jewelry, precious stones, and gold and silver items at street level in various retail jewelry stores. The Jewelry District can be accessed by public transportation through the Metromover and Metrorail. As of 2010, the population of Downtown Miami was 65,696 people, with a population density of 27,487 per square mile. In the 2010 US Census, the racial makeup of Downtown was 57.6% Hispanic of any race, 30.8% White (non-Hispanic), 7.2% Black, and 2.9% Asian. The zip codes for Brickell include 33129, 33130, and 33131. The area covers 1.084 square miles (2.81 km2). In 2000, Downtown had a population of 39,176 residents, with 15,333 households in 1990 with an average of 2.2 residents per household, 17,130 households in 2000 with a household average of 2.1, and 33,600 households in 2009 with a household average of 2.0 residents. By 2014, the population of Downtown is expected to grow to 85,000 with 42,400 households. The median household income was $29,396 in 2000 and $40,180 in 2009. The zip codes for Downtown include 33128, 33130, 33131, and 33132. The area covers 2.117 square miles (5.48 km2). As of 2000, there were 6,451 males and 4,792 females. The median age for males were 34.5 years old, while the median age for females were 35.8 years old. The average household size had 1.9 people, while the average family size had 2.8 members. The percentage of married-couple families (among all households) was 25.5%, while the percentage of married-couple families with children (among all households) was 8.5%, and the percentage of single-mother households (among all households) was 5.8%. 15.3% of the population was in correctional institutions. 1.6% of the population was in other group homes. The percentage of never-married males 15 years old and over was 27.6%, while the percentage of never-married females 15 years old and over was 13.9%. As of 2000, the percentage of people that speak English not well or not at all made up 23.1% of the population. The percentage of residents born in Florida was 26.9%, the percentage of people born in another U.S. state was 25.0%, and the percentage of native residents but born outside the U.S. was 6.4%, while the percentage of foreign born residents was 41.7%. 2009 Census projections indicate that the area's residential base has increased from 40,000 to 71,000 since 2000, with an expected Downtown population of 85,000 by 2014. As of 2006, 189,164 residents live in the immediate Downtown/Brickell area. Public transportation in the Downtown area is used more than in any other part of Miami and is a vital part of Downtown life. Metrorail, Miami's heavy rail system, makes three stops in Downtown on both the green and orange lines at the Historic Overtown/Lyric Theatre Station, Government Center Station, and the Brickell Station. In addition to Metrorail, the Metromover train system runs three lines (the Downtown Loop, the Omni Loop, and the Brickell Loop) with 22 stations throughout Downtown. The Metromover is free and stations can be found at roughly every two blocks in Downtown and Brickell. Metrorail has stops throughout Miami with connections to Miami International Airport, all Metrobus lines, Tri-Rail and Amtrak. The main bus station in Downtown is located next to the Arsht Center at the Adrienne Arsht Center Station. As an urban and pedestrian-friendly area with an extensive public transit network, Downtown (along with Brickell, the Arts & Entertainment District, and South Beach) is one of the areas in Miami where a car-free lifestyle is commonplace. Many Downtown residents get around by foot, bicycle, Metromover or by taxi. The Metromover is a popular alternative to walking in the area, especially on rainy, hot or cold days, as the Metromover is free, and stations are located roughly every two blocks throughout the area. Recently, the City of Miami, along with the Downtown Development Authority, has begun bicycle initiaves promoting citywide bike parking and bike lanes, that have made bicycling much more popular for residents. Bike lanes and bike sharrows are currently planned for the majority of Downtown streets to be painted by the end of 2010. The Venetian Causeway is a popular bicycle commuter route that connects South Beach to Downtown. The Rickenbacker Causeway is very popular on weekends for recreational bicyclists, and often, bicycles can outnumber cars on the causeway. In the 2025 and 2030 long range transportation plans, Miami's commuter rail system, Tri-Rail, has envisioned moving to or adding service on the Florida East Coast Railway (FEC) corridor, which runs along the region's densest neighborhoods, parallel to Biscayne Boulevard in Miami, and Federal Highway in Broward and Palm Beach counties. Tri-Rail service on the FEC line would bring Tri-Rail to Downtown's transit hub, Government Center Station, connecting Downtown directly to Midtown Miami/Miami Design District, Upper East Side/Miami Shores, North Miami, North Miami Beach/Aventura, Downtown Hollywood, and Downtown Fort Lauderdale. Currently, rail commuters must transfer onto the Metrorail in Hialeah to get to Downtown. Miami's Downtown Development Authority along with Miami-area politicians are actively lobbying to bring Tri-Rail to the city core. Taxis are popular in Downtown, especially from Downtown to South Beach, Design District or to Coconut Grove. Since many Downtown residents choose to not have cars, taxis are also popular for rides within Downtown neighborhoods, especially after midnight when the Metromover stops running. Taxis can be hailed on the street, or phoned. Downtown is home to many companies, corporations and organizations. Downtown has about 20,000,000 square feet (1,900,000 m2) of office space, and is the central financial and business hub of South Florida. Some private companies with headquarters in Downtown are Akerman Senterfitt, Arquitectonica, Bilzin Sumberg, Espírito Santo Financial Group, Florida Justice Institute, Greenberg Traurig, Holland & Knight, Limehouse Software, Macy's Florida, Miami Herald, Miami Today, Shutts & Bowen, Terremark Worldwide, Vector Group, World Property Channel, and Zyscovich Architects. Sanford Group Company and Sanford Fiduciary Investor Services, Inc., and LTU International had headquarters in Downtown. Public organizations with their main offices in Downtown include, the central offices of the Beacon Council, the Downtown Development Authority, Miami-Dade County government, Miami-Dade County Public Schools, Miami Police Department, and Miami-Dade Parks and Recreation, as well as numerous City of Miami departments despite city hall's location in Coconut Grove. Japan first opened its consulate in Miami in 1992. As of 1992 this consulate gives logistical support to Japanese embassies in the Caribbean and Latin America. 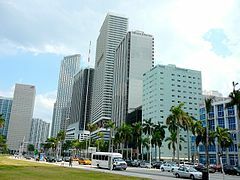 Japan opened a consulate in Miami after Japanese investors purchased several major real estate properties in Florida. Downtown has three U.S. historic districts. The Downtown Miami Commercial Historic District, the Downtown Miami Historic District, and the Lummus Park Historic District. The Downtown Miami Historic District comprises 380 acres (1.5 km2) in the heart of Downtown with over 60 buildings within its jurisdiction. Many of the buildings within the area are of the Moderne style and Classical Revival style with uses for government, residential, and commercial. Periods of significance within this area are from 1900 to 1924, 1925 to 1949, and 1950 to 1974. The Downtown Miami Commercial Historic District was designated a historic district in 1988 and comprises 20 buildings on the east side of Downtown with 19th and early 20th-century revival styles. 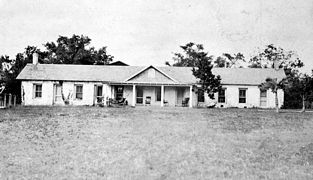 The Lummus Park Historic District is west of Downtown in the neighborhood of Lummus Park. 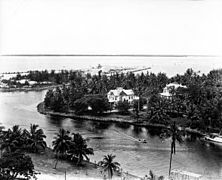 It is west of I-95 surrounding Lummus Park along the Miami River. The historic district was designated historic in 1988 and then expanded in 2006. The area is 260 acres (1.1 km2) large with 43 different buildings mostly owned by private entities and the local government. Prominent styles include late 19th and early 20th-century revival styles, Art Deco, and Bungalow style, with prominent periods of 1900–1924 and 1925–1949. Downtown's largest and most popular parks are Bayfront Park, Museum Park, and Pace Park. Bayfront Park is host to the free DWTWN Concert Series, put on weekly in the park's amphitheater, as well as various other annual events such as the Orange Drop for New Year's, Bike Miami, and the "America's Birthday Bash at Bayfront Park" for Independence Day. Bayfront Park hosts many large outdoor concerts such as Warped Tour and Ultra Music Festival. Formerly Bicentennial Park, Museum Park has been redone, and is now the site for new buildings for the Miami Art Museum and the Miami Science Museum. The Miami-Dade County Courthouse built in 1925, is one of many local, state and federal courthouses in Downtown, centered primarily around Government Center. As the county seat of Miami-Dade County, Downtown is home to the central offices and departments of the Miami-Dade County government, mainly located in the Government Center area. The Stephen P. Clark Government Center is the central headquarters of Miami-Dade government with the offices of the Miami-Dade Mayor. Although city hall for the City of Miami is in Coconut Grove, many offices of Miami's city government are in Downtown, including the city's Planning Department. The Miami Police Department also has its central offices in Downtown. Downtown is home to many city, county, state, and federal courthouses, jails, judge offices, and law firms. Some of the courthouses in Downtown are the Dade County Family Court, U.S. Court of Appeals Judge, U.S. District Court Clerk, Miami-Dade County Courthouse, Federal Courthouse, U.S. Magistrate Judge, City of Miami courthouses and many others. The United States Postal Service operates two post offices in Downtown. They are the Brickell Post Office and the Flagler Miami Post Office. The Federal Detention Center, Miami, operated by the Federal Bureau of Prisons, is located in Downtown. The City of Miami Fire and Rescue Department operates 4 of its 14 fire stations within the Downtown area. Each are listed below. The average apartment sale price was $347,729 in 2010, up 15% from 2009, with the average apartment price at $300 per square foot. During the Miami building boom of the first decade of the 21st century, 23,628 condominium and apartments were built in numerous high-rise towers that quickly transformed the city. Over 85% of these apartments are now occupied as of early 2011. It is estimated that about 550 new residents move to Downtown every month. Renters make up 56% of the residents in Downtown. In July 2011, Downtown's office vacancy rate was reported at 21% dropping from a high of 26% in mid-2010. Downtown also reported an average commercial asking rate of $36.33, making it the eighth-highest in the nation after Manhattan, Washington DC, Fairfield County, Connecticut, San Francisco, and Boston. Historically, Flagler Street has been Downtown's major shopping street dating back to the 19th century. Today, it is still Downtown's major shopping street, with Florida's flagship Macy's (formerly Burdines) on Flagler Street and Miami Avenue from 1912 to 2018, as well as Miami's own local department stores: La Época, on Flagler and SE 2nd Av; Alberto Cortes, on Flagler and SE 3rd Av. Flagler Street is also home to many well-known and established jewelers, many of whom have been in Downtown since the early 20th century (i.e. : Morays Jewelers, founded in 1900). This area is called the Miami Jewelry District and comprises four Downtown blocks from Miami Avenue to SE 2nd Av on Flagler Street and NE 1st St.
After many years of decay, recently, much focus has been placed on revitalizing Flagler Street to its former grandeur. In recent years, a renewed investment interest has been placed on Flagler Street, and many new restaurants and stores have opened up, new landscaping and pavers have been placed, as well as enforced security and tourist guides. Three new pocket parks opened on Flagler St in 2009, Paul S. Walker Park, Robert F. Clark Plaza, and the Joan Lehman Sculpture Plaza. These new parks have brought more green space, benches, art, and rest areas to the street. Besides Flagler Street, Downtown has two other major shopping areas, Bayside Marketplace and Mary Brickell Village in Brickell. Bayside Marketplace was built in 1987, and is one of Miami's most visited tourist attractions averaging over 15 million visitors a year. It is an outdoor shopping mall overlooking Biscayne Bay at Bayfront Park. Bayside Marketplace has many national retail chains, as well as local Miami stores. Mary Brickell Village is on Miami Avenue and SE 10th Street in Brickell. Mary Brickell Village is a major nightlife area and has many of Miami's upscale bars and restaurants that stretch along Miami Avenue from around SE 6th Street to Broadway (SE 15th Road). Adrienne Arsht Center for the Performing Arts, the second-largest performing arts center in the U.S. Bicentennial Park during Ultra Music Festival and Earth Hour in 2010. The Freedom Tower, built in 1925, is a local historic landmark and a symbol of the city. Downtown children are zoned based on the neighborhood they live in within Downtown, roughly split into Brickell, Central Business District (CBD), and Arts & Entertainment District/Edgewater. ^ a b c Miami Downtown Development Authority Archived July 13, 2011, at the Wayback Machine. Miamidda.com. Retrieved on 2013-08-16. ^ "Population and Demographics Profile" (PDF). Miami DDA. Retrieved October 23, 2018. ^ a b "Mapping the 2010 U.S. Census". The New York Times. December 13, 2010. ^ a b "Demographics of Downtown, Miami, FL". city-data. Retrieved August 31, 2009. ^ "Vector Group Ltd". www.vectorgroupltd.com. ^ "Contact Us." LTU International. March 3, 2000. Retrieved on June 21, 2009. ^ "Company Directory." Stanford Financial Group. July 8, 2000. Retrieved on June 21, 2009. ^ "Contactenos Archived 2009-02-03 at the Wayback Machine." Consulate-General of Argentina in Miami. Retrieved on January 30, 2009. ^ "Contact & Overseas Missions Archived 2009-02-16 at the Wayback Machine." Ministry of Foreign Affairs (The Bahamas). Retrieved on January 31, 2009. ^ "The Consulate. "Consulate-General of Brazil in Miami. Retrieved on January 30, 2009. ^ "Oficinas Consulares en Estados Unidos." ^ "- Consulado de Colombia en Miami". miami.consulado.gov.co. ^ "Welcome to the website of the Consulate General of the Dominican Republic in Miami. ", Consulate-General of the Dominican Republic in Miami. Retrieved on January 31, 2009. ^ "Other Consulates in the USA Archived February 5, 2009, at the Wayback Machine." Embassy of Ecuador in Washington, DC. Retrieved on January 30, 2009. ^ "Address." Consulate-General of France in Miami. Retrieved on January 30, 2009. ^ "Address, Contact and Office Hours Archived January 6, 2009, at the Wayback Machine." Consulate-General of Germany in Miami. Retrieved on January 30, 2009. ^ "Consular Offices." Consulate-General of Guatemala in Denver. Retrieved on January 31, 2009. ^ "Diplomatic and Consular Missions Archived 2009-02-21 at the Wayback Machine." Embassy of Haiti in Washington, DC. Retrieved on January 30, 2009. ^ "Consulate-General of Israel to Florida & Puerto Rico." Israel Diplomatic Network. Retrieved on January 30, 2009. ^ "Contact." Consulate-General of Jamaica in Miami. Retrieved on January 30, 2009. ^ "Contact." Consulate-General of Japan in Miami. Retrieved on January 30, 2009. ^ Home page. Consulate-General of Netherlands in Miami. Retrieved on January 30, 2009. ^ "El Consulado Retrieved on January 30, 2009. ^ "Miami Archived 2009-02-21 at the Wayback Machine." UK in USA. Retrieved on January 30, 2009. ^ "JAPAN OPENS CONSULATE TO SERVE SOUTH FLORIDA." Miami Herald. January 10, 1992. 1C Business. Retrieved on January 17, 2012. 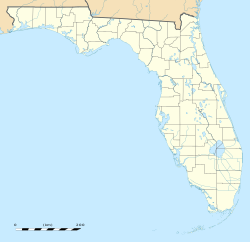 ^ "National Register of Historical Places - FLORIDA (FL), Dade County". www.nationalregisterofhistoricplaces.com. ^ Miami Police Department. Miami-police.org. Retrieved on 2013-08-16. ^ Miami-Dade County - Clerk of Courts. Miami-dadeclerk.com (May 29, 2013). Retrieved on 2013-08-16. ^ "Dade County Courthouse Map Archived 2010-03-15 at the Wayback Machine." Miami-Dade County. Retrieved on March 12, 2010. ^ U.S. Marshals Service, Courthouse Locations. Usmarshals.gov (June 3, 2004). Retrieved on 2013-08-16. ^ "Post Office Location - BRICKELL." U.S. Postal Service. Retrieved on December 30, 2009. ^ "Post Office Location - FLAGLER MIAMI Archived 2012-07-16 at Archive.today." U.S. Postal Service. Retrieved on December 30, 2009. ^ "FDC Miami Contact Information." Federal Bureau of Prisons. Retrieved on December 30, 2009. ^ "DDA Report: Downtown Miami Condos Rise in Sales, Price and Absorption". Pordes Residential. March 2, 2011. Retrieved November 20, 2015. ^ Patel, Julie. "An insurance option worth considering". ^ U.S. Office Market Records Largest Quarterly Decline in Vacancy Rates Since Mid-2007; Miami Posts Strongest Vacancy Drop - WORLD PROPERTY CHANNEL Global News Center Archived March 18, 2012, at the Wayback Machine. Worldpropertychannel.com. Retrieved on 2013-08-16. ^ Freedom Tower in Miami - Guide to Miami's Freedom Tower Archived October 1, 2011, at the Wayback Machine. Miami.travelape.com (April 24, 2009). Retrieved on 2013-08-16. 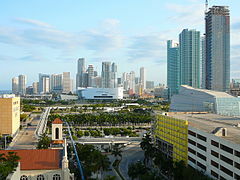 Wikimedia Commons has media related to Downtown Miami, Florida. Wikivoyage has a travel guide for Downtown Miami.